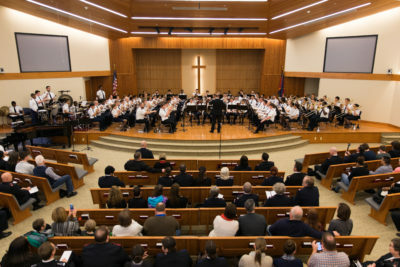 Friday, 17 March 2017, brought together 66 enthusiastic brass and percussion players, 30 members of the New York Staff Band (Bandmaster Derek Lance), two incredible guests, two support staff, and three pastoral officers gathered at Star Lake Lodge in Bloomingale, New Jersey, for the 2017 Future All-Stars weekend. This year’s special guests were James and Thomas Fountain, two young cornet/trumpet soloists with British brass band and Salvation Army background. James is principal trumpet with the Royal Philharmonic Orchestra in London and Thomas is studying trumpet at the Royal Academy of Music. Thomas has followed his brother’s footsteps as principal cornet of Virtuosi GUS Band and the National Youth Brass Band of Great Britain. Future All-Stars was conceived over fourteen years ago as a territorial side-by-side initiative, designed to encourage young Christian musicians in their musical and spiritual journey. Spending a weekend in close proximity with the Staff Band gives the participants an invaluable opportunity to hear how their instruments should really sound in a brass band. In return, members of the Staff Band are able to minister in a very special way and guide these Future All-Stars to become exactly that. Months before the event, the audition material was released and hundreds of hopeful young musicians started practicing, from all over the Eastern Territory and as far away as Texas and Canada. Video and live auditions were submitted and the 2017 All-Stars were chosen. So, to be in this elite group of young Salvationists is a remarakable feat representing many hours of preparation and dedicated practice. The Future All-Stars weekend crams in as much rehearsal time as possible, broken up into full band and sectional sessions. With five full band and three sectional rehearsals, pressure was on to spur the 98-member ensemble to play in time, in tune, and with some sense of style – no mean feat. Territorial Music Secretary Derek Lance was joined by Bandmasters Christopher Ward and Matthew Luhn (NYSB principal cornet and principal trombone, respectively) in this endeavor. The repertoire was an eclectic mix of old and new Salvation Army compositions with something for everyone to get their musical teeth into. Once everyone had arrived and settled in, the hard work began with a full band rehearsal. Those new to the experience were no doubt thrilled and “blown away” by the sound world that is the Future All-Stars band. The early sessions always take a few minutes for everyone to get used to the sounds around them and for the newcomers nerves to settle. One new aspect this year was a Saturday evening concert by the Staff Band at Star Lake Lodge following a full day of rehearsals. The All-Stars were given the chance to hear the Staff Band flex their musical muscles in three major works: The Present Age (Leslie Condon), Corpus Christi (Robert Redhead), and I Surrender (Marcus Venables). The Fountain brothers excelled in Jubilance (William Himes) played by James and Crossroad (Stephen Bulla) played by Thomas. They showed off their teamwork in Martin Corder’s sparkling duet Synergy. As this was a public concert, there was a nice mixture of All-Stars, Staff Band, and Star Lake alumni, notably retired Staff Band principal cornet and Bandmaster Derek Smith. Always an encourager, Smith spent time with the two soloists after the program, no doubt passing on sage advice and positive feedback. The concert also gave the All-Stars a much-needed break from playing, because after a qucik snack they were back in the big room for another full band session. Curfew on both nights of the weekend was midnight, allowing for some down time in the game room before lights out. Sunday began with a hearty Star Lake breakfast which was enough to give the All-Stars some “fire in their bellies”. As usual, Greg Tuck and the Lodge staff took care of all of the dietary needs for the weekend and made sure everyone felt at home. Morning worship followed with the theme “I lift my voice”, which Majors Richard and Linda Lopez had been sharing during devotions throughout the weekend. James Fountain played the beautiful devotional cornet solo I Surrender All (arr. Andrew Mackereth). A testimony time led by Major Linda Lopez had Staff Band members and All-Stars sharing their faith journeys and stories. Lt.-Colonel James LaBossiere opened the Word and the congregation enjoyed praise and worship with the help of Andrew Boynton. Following lunch, the All-Stars made their way via coach to Montclair Citadel Corps to set up and add some finishing touches to the final program. The concert began with Fanfare of Praise (Robert Redhead). The composer would have been proud of the trombone section’s delicate opening and in particular the percussion really helped keep the ensemble together in the faster passages. Bandmaster Ward worked the ensemble hard throughout the weekend and the preparation shone through as the All-Stars gave a very credible performance of Dean Goffin’s Arise, My Soul, Arise. Although this is not a piece that springs to mind for a massed-band setting, the young players rose to the occasion and saved themselves for the uplifting last section. Softly Softly (Ray Farr) was up next, also led by Bandmaster Ward, providing a toe-tapping contrast to Goffin’s prelude and fugue. Testimonies are a tradition of the Future All-Stars weekend and are usually reserved for older members who are able to look back at how the experience has shaped their lives. Mackenzie Dalrymple and Katelyn Knickerbocker both spoke confidently and from the heart about their individual faith journeys and how the Lord is preparing them for the next stage in life as they wrestle with the prospect of going to college and leaving their families. Bandmaster Matthew Luhn led the band in Kenneth Downie’s classic devotional In Perfect Peace, another brave choice for massed band. In rehearsal, this music really exposed how important it is to work hard at the quieter dynamics and Bandmaster Luhn drew out some beautiful sounds from the mammoth group. Special mention must go to the duet featuring Matthew Burn (principal cornet) and Albert Saintilus (principal trombone). Many players have foundered on these tricky six bars. The band’s chorus leader, Dorothy Gates, worked hard with the Future All-Stars chorus in her vocal arrangement of Peace. This was accompanied on piano by Lorena Simmonds-Lance and a trombone trio from the Staff Band (Matthew Luhn, Nathan Power, Warren Smith). The chorus was breathtakingly quiet at times which was a serene oasis in what was a relatively raucous concert. Of course, the weekend’s soloists were in top form. James Fountain showed off his trumpet skills with Viruosity (Kenny Baker), a rip-roaring solo with fingers and notes flying all over the instrument. Thomas Fountain blessed the audience with his exquisite quiet sound in Don’t Doubt Him Now (Leonard Ballantine). Peter Graham’s duet Quicksilver was particularly relevant as retired Staff Bandmaster Ron Waiksnoris and Deputy Bandmaster Gordon Ward were in the audience. The duet was originally written for them and they were also instrumental in the Future All-Stars concept and execution from the beginning. As an encore, the brothers treated the audience to Memories of You (arr. Geldard) in which they traded solos and let their hair down in the big band style of Ted Heath. Bandmaster Lance introduced the final piece, Fire in the Blood (Paul Lovatt-Cooper). In doing so, he explained the importance of the Future All-Stars initiative and how it has helped develop and nuture quality brass players in the Eastern Territory. As an accomplished percussionist, Lovatt-Cooper’s music is always rhythmic in nature. Bandmaster Lance kept the tempo brisk and managed to make the ensemble sound more dextrous than would be imagined from such a large group playing such demanding music. The audience responded to the final climax with a resounding round of applause and Future All-Stars 2017 drew to a close with the Staff Band’s traditional vocal benediction, Rock of Ages. This article was posted in News and tagged Albert Saintilus, Andrew Boynton, Christopher Ward, concert, Derek Lance, Derek Smith, Dorothy Gates, Future All-Stars, Gordon Ward, James Fountain, James LaBossiere, Katelyn Knickerbocker, Linda Lopez, Lorena Simmonds-Lance, Mackenzie Dalrymple, Matthew Burn, Matthew Luhn, ministry weekend, Nathan Power, New York Staff Band, Richard Lopez, Ronald Waiksnoris, special event, Star Lake Lodge, Thomas Fountain, Warren Smith on 26 May 2017 .